Iliana Oris Valiente has been on the phone since 6 am the day of our interview, either talking with her team or connecting with clients in different time zones around the globe. Running both Accenture’s Canadian blockchain innovation group and leading the Accenture Canada Innovation Hub keeps her busy, but her work is far more human-focused than her titles may suggest. #movethedial sat down with the innovation leader to learn more about her career so far, how Accenture solves problems for clients and industry, and asked her advice on how entrepreneurs of all sizes can approach problem-solving in the 21st century. Born in Russia, Oris Valiente had a global upbringing, living in Cuba, Denmark, and now Canada. Growing up, she spent most of her time learning about the world around her. But it wasn’t until she ended up at Deloitte, initially doing valuations, that she discovered blockchain. After this realization - and a lot more reading and asking questions - Oris Valiente became the blockchain strategy lead at Deloitte, spinning out a company, AION, that still exists today as a venture-backed startup. She also founded ColliderX, a nonprofit that matchmakes between corporations looking for blockchain research and researchers looking for their next project. 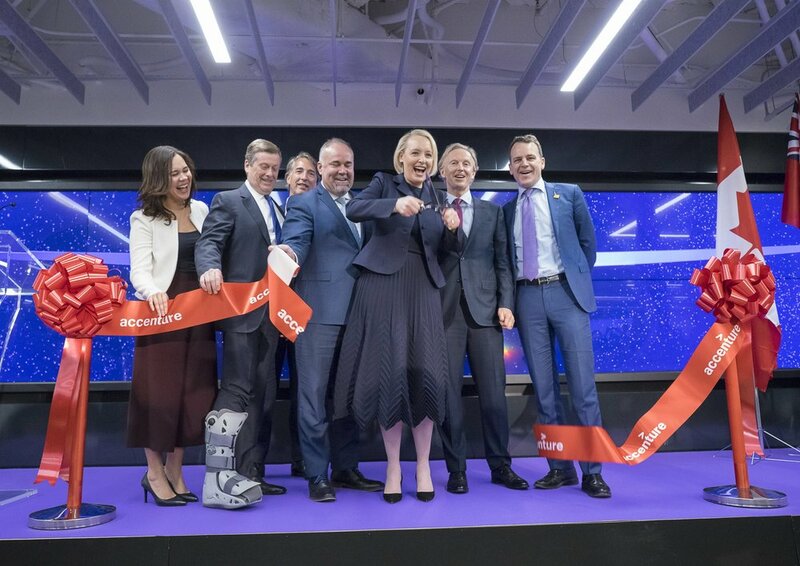 After her successes with ColliderX and AION, Accenture was her next move. She initially joined as the managing director of blockchain innovation for the global consulting firm, helping clients around the world understand blockchain technology and how it applied to their businesses. Soon after joining Accenture, Oris Valiente moved into the Canada blockchain lead role and doubled up her duties by taking on the leadership of Accenture Canada’s Innovation Hub. It’s in this hub, occupying three stories in an office tower in downtown Toronto, that Oris Valiente helps Accenture clients solve some of their toughest problems. It’s also where the consulting giant takes on industry-wide issues, using its influence and network to bring the right stakeholders to the room. This is all part of Accenture’s offering and all part of Oris Valiente’s day-to-day. She may be helping a company individually, identifying an industry trend, or connecting all the dots on a major societal issue, but the problem-solving frameworks are all decidedly human. When it comes to how Oris Valiente helps her clients solve problems, it’s about “helping clients prioritize their ideas on impact and feasibility”. Only then does she pull out what she calls “internal enablers” like AI, drones, or blockchain. Put another way: innovation is about helping the humans, not just focusing on the technology. When it comes to innovation, entrepreneurs don’t necessarily have to work with Accenture to get access to their way of thinking. Not only does the firm post multiple articles online and sponsor public research, but Oris Valiente also shares the stages of innovation that she uses with clients. For startups and even big companies, there’s more to rapid innovation than simply shortening release cycles from three years down to one month. It’s about communication and expectation-setting with your customer base. From a kid reading books and asking questions to a global consultant doing the same thing on a bigger scale, Oris Valiente always wanted to learn more about people and understand what makes them tick. Now she’s in a senior level position and is passionate about giving back, using her image and position to help others wherever she can. This is because of, at least in part, the people who took her under their wing.